You would never suspect upon meeting him for the first time that Imam Adeel Zeb has only been at the University for a year. 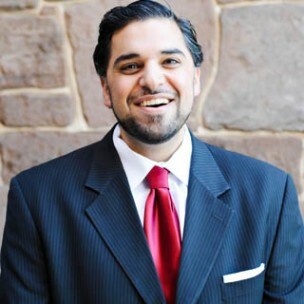 With a beard and flowing hair that would look right at home at WestCo and a calm but inviting disposition, the University’s new Muslim chaplain seems more like a returning alumnus or a supportive older brother than a religious leader with over 10 years of experience in public service. First impressions aside, Zeb’s qualifications speak for themselves. Last year, he received a master’s degree from the Islamic Chaplaincy Program at Hartford Seminary. Before that, he served as the Muslim chaplain of American University in Washington, D.C. Now, in addition to acting as Wesleyan’s imam, a term used mainly by Sunni Muslims for someone who leads prayers and guides the congregation, he also serves as the imam at Trinity College. Raised in a non-religious environment, Zeb discovered his passion for Muslim leadership in college when he made a pilgrimage to Mecca known as an Umrah. On the trip, Zeb was deeply moved by the unity and religious devotion of the people he encountered. When he returned, he began attending Friday prayers at a local mosque, studying Islamic texts, and engaging more deeply with the Muslim community. “It was a time of repentance and awakening for me,” he said. It was after his college days that Zeb realized his desire to become involved in Muslim leadership, though he never specifically set out to become an imam. Instead, Zeb was gradually driven toward the role after years of study. As he learned more about his religion, he also developed a strong will to guide people toward faith. The requirements for becoming an imam vary according to location and congregation. Zeb’s training process required him to visit hospitals to practice pastoral care and learn techniques for connecting with congregation members. In his preparation, he also completed an academic program that required him to research both religious and secular accounts of Islamic history. Still, he is not done learning. He cites becoming a spiritual leader as an ongoing process of contemplation and correction. Of course, there are certain pressures that come along with serving as a spiritual guide. Zeb worries, for example, that he will not be able to live up to his congregation’s expectations of him. He strives to function as a role model for the community, but insists that he is by no means a paragon of righteousness. “When you’re in that position, people look up to you to be a standard vanguard of moral, ethical, and religious excellence—perfection, even, in their eyes—and that’s very difficult to obtain,” he said. The small size of the University’s Muslim community, which comprises between 50 and 60 students from around the world, presents Zeb with other challenges. Fewer people available to organize programs means fewer events for Muslim students at the University. It also means less attention to the Muslim populace from the general University community. Still, having a small Muslim community creates a sense of family that Zeb cherishes. With so few students in his congregation, he is able to pay personal attention to each one. He finds privately tutoring students in Islamic readings to be especially rewarding. Zeb is working on creating a sense of kinship not only among Muslim students but also between the Muslim community and the other religious communities at the University. He and the other chaplains at the Office of Religious and Spiritual Life meet regularly to discuss religious diversity on campus and plan projects to bring students of different faiths together. A program about differences in belief and upbringing is in the works for next semester. Through programs like this, he hopes to encourage students who were raised to have prejudices to put their differences aside and realize commonalities. “In my experiences, usually people aren’t going to clash necessarily because of cultural differences, but they will clash because of programmings that they’ve had in the past,” he said. Zeb’s other major goal is to establish a family-like structure for the Muslim community that will remain a staple of the University’s religious life for a long period of time. “I want to build something while I’m here that can be utilized in the future of Wesleyan and the Muslim community here,” he said. He certainly has wood to chop, but Zeb is creating a steady foundation for his vision. On Monday nights, he’ll be screening episodes of “Omar,” an Arab drama series about a Muslim historical figure, in Turath House. He also plans to invite speakers like Tehara Ahmad of Northwestern University, the only full-time female Muslim chaplain at a university in the United States, to discuss controversial issues. Additionally, he’s trying to organize an Umrah to Mecca similar to the trip that inspired him to become a Muslim leader when he was in college. He may have only arrived in Middletown a year ago, but Zeb is already engaging many people on campus. Regardless of your religious beliefs, you would be remiss not to stop by the Office of Religious and Spiritual Life to introduce yourself to Zeb. Great post! Thanks for sharing good post in your site. Raised in a non-religious environment, Zeb discovered his passion for Muslim leadership in college when he made a pilgrimage to Mecca known as an perform to Umrah. Of course, there are certain pressures that come along with serving as a spiritual guide. Zeb worries, for example, that he will not be able to live up to his congregation’s expectations of him. He strives to function as a role model for the community, but insists that he is by no means a paragon of righteousness.